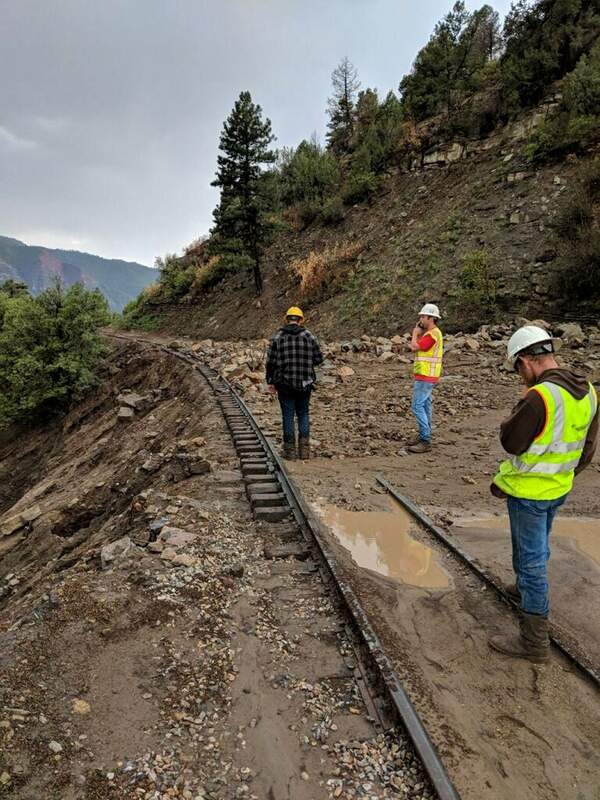 The Durango & Silverton Narrow Gauge Railroad said ridership is down about 27 percent this year as a result of the 416 Fire and subsequent debris flows that washed out sections of track north of Durango. Ridership is down about 27 percent this year on the Durango & Silverton Narrow Gauge Railroad as a result of the 416 Fire, but on the bright side, the railroad hopes to repair its tracks and resume full service by Sept. 15. The tracks were damaged by mudslides that hit the area July 24. Since then, the railroad has transported customers from the depot to its Rockwood station via bus where the train departs to Silverton. D&SNG General Manager John Harper gave the business update during the “state of the community” address Thursday at the DoubleTree Hotel. The event, an “Eggs and Issues” discussion put on by the Durango Chamber of Commerce, featured local government officials and private business owners who talked about flooding from the 416 Fire burn scar, the La Plata County land-use code and issues on the fall ballot. TrainThe train reported 54,000 cancellations resulting from the fire and subsequent debris flows. By comparison, the train typically has about 197,000 passengers per year. As part of the repairs to the track, the railway is using five different contractors to build an interlocking rock wall surrounded by a geotech fence around the damaged portion of the track. Two additional contractors are doing ditch work along roughly 4 miles of track between Hermosa Crossing and the Irongate subdivision, Harper said. The railroad will also build a 5,000-square-foot building to house two diesel locomotives that are expected to arrive in May. Employees will undergo a 30- to 60-day training period before the engines will be available to use, he said. The railroad will also convert one locomotive to be an oil-burning engine, Harper said. Such a conversion process has never been done before by the railroad, and engineers are going through the process carefully. Harper said the conversion won’t be complete for 10 to 14 months. San Juan National Forest The U.S. Forest Service is working to stabilize roads and storm-proof the burn area of the 416 Fire. Though the mitigation helps, there’s not a lot the Forest Service can do to prevent debris flows. “There is simply no way for us to do that,” said Kara Chadwick, San Juan National Forest supervisor. Vegetation on the burn scar will begin to grow back sooner than one would expect, she said. Only 7 percent of the burn area suffered severe damage, while 46 percent received minimal damage or is unburned. The Forest Service also hopes to do prescribed burns to improve forest health in the fall. The burns were originally planned for the summer, but a lack of resources caused them to be postponed. A bear whose paws burned during the 416 Fire has fully recovered. Colorado Parks and Wildlife will release the cub when it seems fit, she said. BP AmericaDespite the recent news that BP American Production Co. is looking to leave La Plata County, area manager John Mummery told community members the company is planning to move downtown in October. Mummery discussed Initiative 97, a citizens’ initiative that increases the setbacks needed for oil and gas companies to extract resources. He said the initiative would make large amounts of the state off-limits to extraction. City and county officials La Plata County will hold a public meeting for all residents directly affected by the floods to discuss if they want to take part in a Natural Resource Conservation Service program, La Plata County Commissioner Gwen Lachelt said. The meeting will occur at 5:30 p.m. Thursday at the La Plata County Fairgrounds. The county will also release sections of the proposed new land-use code to the community for public comment over the course of the next year, she said. In the November election, the city will ask voters to approve a ballot initiative, which consists of a combined property tax and sales tax increase to help fund a new police station and street maintenance, said Durango Mayor Sweetie Marbury.